Join in community with Give Back Yoga Foundation and One Million Faces at Yoga Journal LIVE! in Estes Park. Join us on October 1st through 4th at Yoga Journal LIVE! in Colorado to deepen your practice and help us to give back yoga. Share in a free community Yoga for First Responders class, and join us for a Give Back Yoga presentation to find out how you can give back from the mat to those who are most vulnerable. Get your photo taken in support of the programs of Give Back Yoga, and be a part of the live Remixing Resiliency prayer flag installation at the Sangha Space inside the Yoga Marketplace. Don’t miss your chance to be a part of this revolution! Join us for a brief overview of how the Give Back Yoga Foundation can support you in giving back from the mat to those who are most vulnerable. To find out more about the populations we serve, stop by our Programs and Projects pages. When we step on our yoga mats, are we setting intentions that cover the full spectrum of what yoga has to offer? Or are we habitually concerning ourselves with only the physical benefits of our practice? Join us in the Yoga Journal LIVE! Sangha Space for a free community class that explores the potential of change that yoga can provide on a neurological level — including putting an end to the adverse effects of stress, and building mental and physical resiliency. This approach serves as the basis for Yoga for First Responders, a program that helps emergency personnel to cope with stress and trauma, find resilience, and support peak performance. The techniques and practices offered through YFFR can help every human being to find resilience and inner strength for facing life’s challenges. This free community class is open to all, and first responders who attend the event will take home a free gift of a high-quality athletic size yoga mat donated by Gaiam to support your personal practice. The One Million Faces project is the brainchild of artist and photographer Peggy Dyer. Through this project, Peggy has worked with families, veterans, yogis, entrepreneurs, spiritual leaders and everyone in between — capturing the power of their story through portraits with whiteboard messages. In the six years since it was founded, the OMF Project has blossomed into community art events all over the world that blend art with heart, inspiring connection and conversation. T he YJ Live One Million Faces: Remixing Resiliency prayer flag installation weaves threads of connection that invite people to engage in the story and mission of Give Back Yoga through images of first responders, national guardsman and fireman, and other inspired faces from the One Million Faces archive. The result is a compelling tapestry of portraits that allow the beauty of each person to light up the sky — portraits that are at once playful, emotive, expressive, honest and compelling. As an photographer, Peggy is deeply committed to the importance of community connection and healing through art, working intimately with local communities that were severely impacted by the flooding Colorado experienced in September 2013. Learn more in the video below. Through the Remixing Resiliency project, Peggy hopes to spread awareness of the hope and lasting tools for inner peace that programs that like Yoga for First Responders can offer. We invite you to add your face and voice to this evolving art installation, raising funds and awareness for this mission. The One Million Faces project is a conversation of community, a call for change, an invitation to express and have your voice be heard and seen. What’s your message? What’s your story? Join the conversation and the evolution today! One Million Faces Lyons Project from Peggy Dyer on Vimeo. We’re honored to introduce you to a new member of the Give Back Yoga team: Anthony Scaletta, our new Outreach Coordinator for our Yoga for Veterans programs. From 1998-2003, Anthony served as a US Navy Special Warfare Combatant Crewman (SWCC) with Naval Special Warfare Group 1 out of San Diego, CA. An 11 Meter RHIB operator, he did two deployments to the Northern Arabian Gulf region, conducting Maritime Interdiction Operations and reconnaissance missions. As a result of his service, he was diagnosed with PTSD, anxiety, depression and OCD, while also suffering chronic pain and a spinal fusion surgery. It was through these “opportunities,” which he used to call obstacles, that yoga found Anthony. The practice immediately resonated with him as a way to heal and reintegrate after his military service. Today, Anthony’s post-military mission is to be of service by bringing the transformational practice of yoga to others — especially veterans — as a way to ease their suffering and empower them toward healing. As a combat veteran and a certificated yoga teacher, Anthony is uniquely aligned to help lead the way for this current generation of veterans as a yoga teacher and advocate. In his role as Veteran Outreach Coordinator, Anthony will help Give Back Yoga to reach our goal of sharing free yoga and meditation resources with 30,000 veterans. 1.) Help Anthony travel to the Warriors For Healing event hosted by Yoga Journal LIVE! in San Diego this June. This is an amazing opportunity for Anthony to work one-on-one with fellow veterans and yoga teachers who share the goal of making yoga more accessible to returning warriors. By making a donation of $10 or more to our crowdfunding page, you can help to cover the costs of his trip. 2.) Set up your own crowdfunding team. You can fundraise as a studio community, an individual, or with your friends. The Warriors For Healing foundation is offering crowdfunding incentives for each team that earns at least $250 (including valuable promotional spots that can benefit your studio or business). 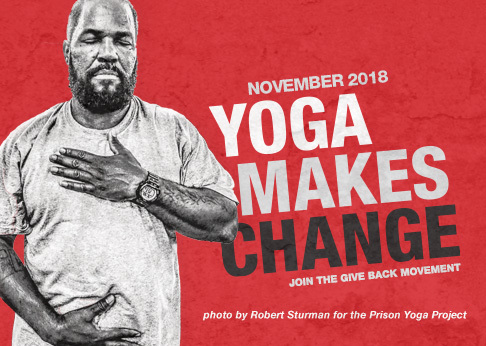 And all funds raised through Give Back Yoga’s unique crowdfunding page stay with our organization, supporting the growth and development of our veterans’ programs. As lead ambassador, Anthony can help you get set up as a GBYF Warriors For Healing team, and add you to a Basecamp project that will help to keep the fundraising ideas flowing. Make an impact: donate $10 or more to help fund Anthony’s outreach trip to San Diego, or contact Anthony@GiveBackYoga.org to learn how to get started with your own Warriors For Healing crowdfunding team.